The world’s most watched live-music event is the Eurovision contest, with 186 million viewers in 2018. 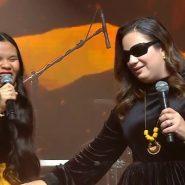 Israel’s Neta Barzilai won this last year’s contest, and last night Israel chose who will represent Israel in this year’s contest, to be held in Tel Aviv. The biggest stars, though, of the finals to choose this year’s representatives weren’t the musical group that actually won last night. The biggest stars were the 7 disabled participants of the Shalva Band who dropped out. After Eurovision officials refused to accommodate the observant members of the Shalva Band and ensure that their participation in the contest would not require them to break Shabbat, the Shalva Band withdrew from the Israeli Eurovision finals. With that difficult decision, the Shalva Band threw away an opportunity to achieve fame and fortune. Which made me think…Not all the members of the Shalva Band can see, but it seems that their vision of what is truly important is crystal clear. May the band’s participants: Anael, Dina, Tal, Yosef, Yair, and Sara be blessed with much success in everything they do! Please do not leave out Omer Adam who chose Gd over Eurovision as well!!
. They are making the best of it by using their beautiful talents. They should be blessed by God tremendously by doing what they have done.